MOSCOW (Sputnik) - The Ukrainian authorities started the transfer of head of RIA Novosti Ukraine news portal Kirill Vyshinsky from Kiev to the city of Kherson to select a preventive measure, Vyshinsky's lawyer told Sputnik. Vyshinsky was detained in Kiev on Tuesday. He is suspected by the Ukrainian authorities of supporting the self-proclaimed Donetsk and Lugansk People's Republics and treason. 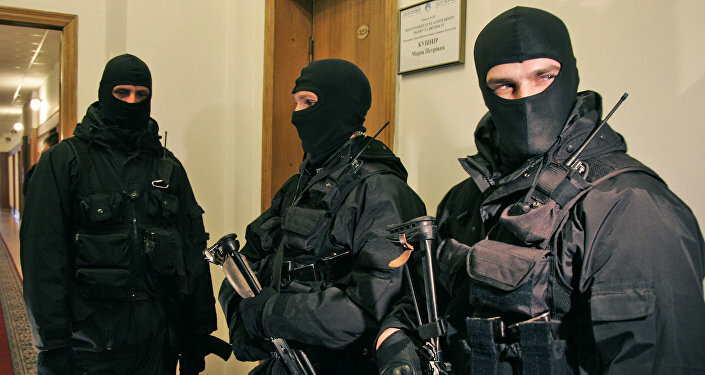 On the same day, the Ukrainian Security Service (SBU) broke into the office of RIA Novosti Ukraine in Kiev. "He [Vyshinsky] is being transferred to Kherson to choose a preventive measure," the lawyer said. SBU claimed that Vyshinsky had a dual citizenship, and the Ukrainian authorities would consider the issue of stripping him of the Ukrainian passport. The Committee to Protect Journalists in a statement said it is concerned about the imprisonment of the head of RIA Novosti Ukraine news portal. "The Committee to Protect Journalists today expressed concern over the Ukraine Security Service's (SBU) search of the Kiev office of the Russian state news agency RIA Novosti and detention of the office director, Kirill Vyshynsky," the release said on Tuesday. The CPJ was not able to locate Vyshynsky and find out whether he had been formally charged, the release said. The organization has previously reported on anti-press violations by both Ukraine and Russia, and urges both sides to respect the role of a free and independent media, the release added.